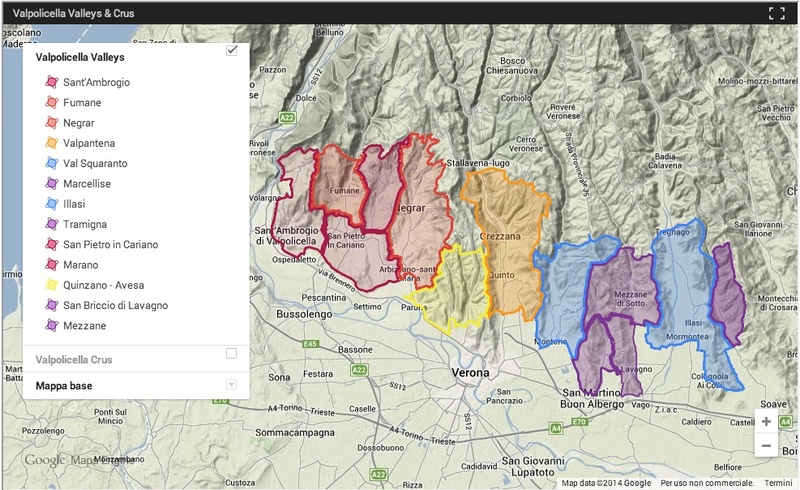 This map shows the vineyards which fall within the boundaries of the production zone of the Valpolicella appellation (the DOC) and, accordingly, as well, the Vapolicella Ripasso DOC, the Amarone della Valpolicella DOCG and Recioto della Valpolicella DOCG, which share the same identical geographical area. (...) No distinction is made either between the various grape varieties cultivated or between vineyards registered to the aforementioned appellations and those registered to other DOC or IGT (Typical Geographical Indication) categories, whose territories may partially overlap with this area (be they red grape or white grape wines). (...) Though it is true that, in the Valpolicella, the exact site of the provenance of the grapes has always had a certain importance, it is equally true that a tradition of vineyards conceived as crus is not as firmly established here as in other viticultural zones as, for example, in Barolo. Tracing boundaries, therefore, turned out to be a difficult task and one with more than a few pitfalls, and for this reason I encourage readers to see this mapping and delimitation both as a serious proposal in its intentions and something tentative and not binding in terms of the results. This being said, I beg our understanding in the case of evident inaccuracies or errors. As far as classifications are concerned, the decision to map solely hillside vineyards does not imply on my part any qualitative hierarchy between the hillsides and the vineyards in the plains, both because this is not part of the purpose of this work and because it is a complex and insidious question, one with many exceptions, which would require not merely much time but also ample and precise competence. (...) I preferred to focus my attention on that area where, historically, the name of spots closely linked to viticulture are more frequently found, and therefore on the hillsides.